On Monday, Scottish actress Louise Linton, wife of Treasury Secretary Steve Mnuchin, flaunted her designer goods on social media and then bragged about her wealth after she was criticized for being out of touch and elitist. 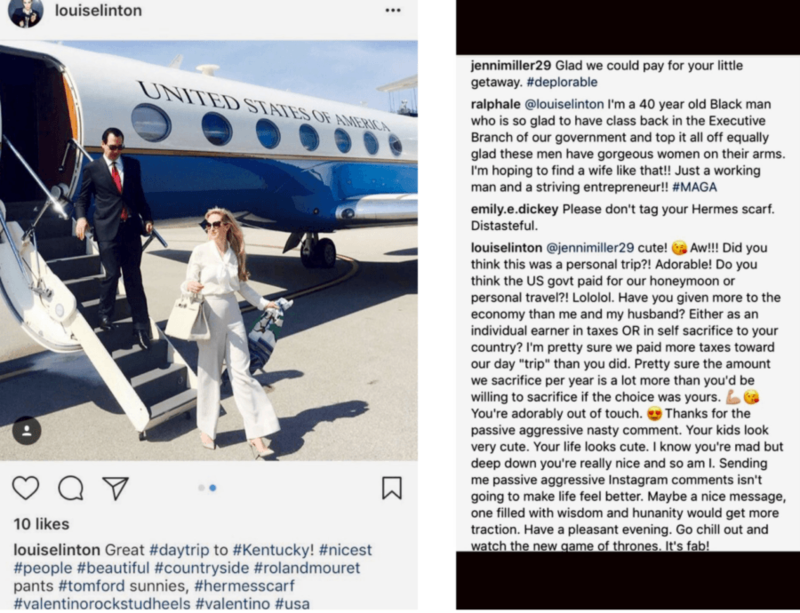 Using her Instagram account, Linton posted a photo of herself stepping off an Air Force plane after an official visit to Kentucky with her husband. In the post she hashtagged the designer brands she wore to the fifth poorest state in the nation. “Great #daytrip to #Kentucky! #nicest #people #beautiful #countryside #rolandmouret pants #tomford sunnies, #hermesscarf #valentinorockstudheels #valentino #usa,” she wrote. Eventually, Linton removed the photo and made her profile private, but not before the damage was done. The photo was seen by viewers and went viral on Twitter. Miller’s response led to a taunt by the actress that stunned viewers. “You’re adorably out of touch,” Linton said. Miller told The New York Times she didn’t think her response would catch Linton’s attention. “I think my post was just five or six words, and she had to go on basically a rant about it to make herself look more important and look smarter, better, richer—all those things,” Miller said. President Donald Trump and First Lady Melania Trump attended Mnuchin’s and Linton’s extravagant June wedding in Washington D.C., which Vice President Mike Pence officiated. Linton has appeared in television series “CSI: NY” and “Cold Case,” as well as the film “Cabin Fever.” She was criticized for her memoir about volunteering in Africa, which critics found to be patronizing and inaccurate. Her husband is a wealthy former Goldman Sachs executive who worked with Trump before becoming Treasury Secretary. The Treasury Department told The New York Times that Mnuchin and Linton have reimbursed the government for the trip and that Linton was not promoting the designer labels she referenced.